The Oslo Philharmonic can trace its roots back to the 1870s, Edvard Grieg and Johan Svendsen, and was established under its present name in 1919. At its home venue, Oslo Concert Hall, the orchestra is annually giving 60-70 concerts, most of which are broadcast by Norwegian National Radio. The concert programme has a high international profile, as for the repertory as well as the performing artists. The orchestra also has school and outreach programs, outdoor concerts in Oslo drawing up to 25,000 listeners, and nationwide touring programs. With Mariss Jansons, Music director 1979-2002, the orchestra achieved great international fame. Touring activities from 1982 and on included regular visits at most of the major venues in Europe, like festivals such as BBC Proms, Edinburgh, Lucerne and Salzburg and residency at Vienna Musikverein, as well as major venues in the Americas and East Asia. In 2002 Mariss Jansons was succeeded by André Previn, and in 2006 the orchestra signed a five years contract with Jukka-Pekka Saraste, later to be prolonged until 2013. With Maestro Saraste, now Conductor Laureate, the orchestra has had highly successful concerts for instance at the BBC Proms (RAH) and Barbican Hall in London, Vienna Musikverein, Berlin and Cologne Philharmonieand European festivals. In February 2011 Vasily Petrenko was introduced as Chief conductor from the season 2013-2014. The appointment has received great national and international attention, and already in 2011 he and the orchestra did successful concerts in Berlin, Vienna, Bratislava and Paris. On the 2013-2014 touring schedule with Maestro Petrenko are BBC Proms and Japan. 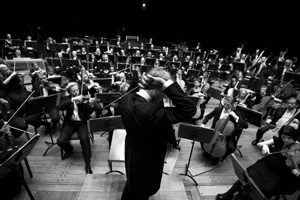 As a recording orchestra the Oslo Philharmonic reached international fame during the 1980s, with their Tchaikovsky cycle on Chandos. In 1986 they signed the by then most extensive orchestra recording contract in the history of EMI. The present discography includes more than 100 titles within a wide range of repertory, and also DVD and Blu-ray releases.